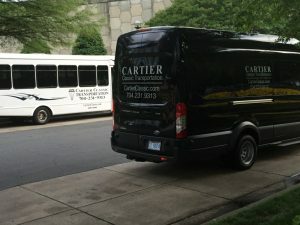 Charlotte Limousine Transportation & Bus provides Charlotte with reliable and professional charter bus services, Corporate Shuttle Service and Limo Bus Services. Our private shuttle and coach division operates throughout Charlotte and Surroundings. We offer modern Coach Buses, Minibuses, Shuttle Buses and Limo Party Buses Services. Depending on your specific transportation needs, Charlotte Limousine Transportation has the best vehicle for your event or corporate group. Our Shuttle Services and luxury charter buses offer spacious seating arrangements, state-of-the-art amenities and plenty of luggage room. Charlotte Limousine transportation will make your next Charlotte business event transportation safe, reliable and trouble free. Your group will enjoy their Charlotte shuttle bus transportation in total comfort. Whether you’re planning a surprise birthday party, a birthday lunch, or a birthday dinner, at Charlotte Limousine we feel and share your happiness and like to be among your crew to make this day classy and extra special for you and make sure you don’t worry about transportation. Charlotte Limousine Transportation has been providing airport and charter limousine service around the Charlotte and surrounding area for over 15 years. Our extensive fleet of stretch limousines and sedans, SUV limos and luxury vans, and even classic cars will fit almost any need in Charlotte. Our vehicles are always kept in top condition, so that you get a like-new ride, every time. Also among our top priorities are courtesy, timeliness, safety, whether you’re on a luxury Charlotte tour or just a ride from the airport. We also pay our chauffeurs better than anyone in the business, ensuring that your Charlotte Limousine limousine rental is everything you could hope for. We serve the entire Charlotte and Surrounding Area business travelers and individual looking for professional, affordable airport limousine service. But we also provide limousine services for Charlotte area planners and partygoers who want to celebrate in style, and tourists or locals who hope to see a whole new side of Charlotte or all North Carolina. Browse our site or contact us today for more information about our limo services! 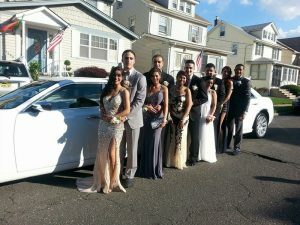 Prom Night is a very special evening for all high school students. Parents spend lots of money on everything from dresses, shoes, to the Limo. They hire a limo to ensure their childrens safety and for their own peace of mind knowing a professional chauffeured limousine will pick them up and deliver them back home to their front door safely. Make your “Most Remarkable Day” of your life more special by Charlotte Limousine Wedding Limo Service. Your wedding party limo will be the most beautiful latest model limousine imaginable, with all the special amenities you desire. Our chauffeurs are always on time, courteous, and dressed professionally. Let us take you from the hotel to the reception, and from the reception to any special place for your honeymoon. You don’t need to be worried about transportation from each destination, we can help arrange your wedding party pick-ups and drop-offs and everything in between. 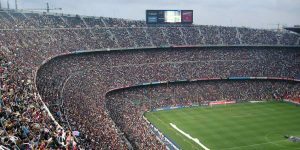 Whether you want to see Charlotte, Panthers Football, Basketball, Baseball, Hockey game and many more, we will provide you with new model luxurious stretch limousines, SUV’s and deluxe town car Sedan limos to make the event hassle free from traffic and parking to and from any stadium. Let the professional chauffeurs of Charlotte Limousine Service take you to your next sporting event with comfort and style. We get you there on time safely and in style. Seats 6 Passengers. If you want the best and newest vehicle for corporate transportation, this is the vehicle for you. Fully loaded with (3) DVD screens, Bose Premium sound system, XM Radio and iPod jacks if you prefer to bring your own music on your iPod or smart phone. The Suburban is the ultimate corporate vehicle for top executives in any industry. From its baby soft leather interior and wood grain trim to the black out windows, full chrome trimmed exterior that includes beautiful 20” alloy wheels, this is the vehicle to arrive in when you are wanting the ultimate in a Corporate luxury SUV. 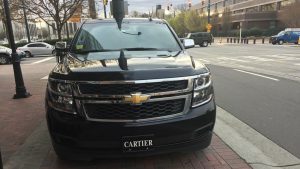 This 7 Passenger Chevy Suburban LT is the latest in the Corporate transportation, and is ready for top executives, celebrities and high profile clients traveling in and out of Charlotte for sporting, entertainment and business events. The LT is fully loaded with 4 heated captain chairs and one bench seat in the rear for three adults comfortably. Equipped with an amazing bose sound system. CD/DVD Player, Ipod Jack, on star, touch screen GPS navigation system, black leather seats and interior, dark tinted windows and climate/audio/video control in the middle and rear sets. The Storage space in the rear provides plenty of room for luggage and personal items. Prices above do not include driver gratuity, service trans. fee, and fuel.